We have started to make changes to our pages covering live events, the aim being to provide a service which is faster, while making it easier to access our live video and audio coverage. Initially the changes will only be visible for a small number of events, during this period we will provide opportunities for feedback, taking any comments into consideration as the alterations are applied to other sports and events. Below we answer the most common questions relating to the new pages. One of the main differences is that the new pages are much faster to load, this means users will see updates more quickly no matter what device they are on. We've been able to do this by moving to a new technology framework that allows us to deliver the page more efficiently and bring performance benefits to our audience. We've also taken feedback into consideration and improved the page design to make video and audio more readily accessible when the page first loads; users no longer have to hit a tab to see the best of this content. These changes have been made with the Rio Olympics in mind as we look to provide the best possible service for what promises to be a spectacular event. What improvements are there in the new version? The pages are faster, both on first load and also once a user is in the page - text updates, scores and more all coming through more quickly. In real terms, the page is now more than twice as fast, on mobile devices especially - the device so many people use to follow live events - the improvement is particularly noticeable. We have also made the page simpler to navigate by reducing the number of tabs that previously hid content. You will now be able to see more video and audio without selecting a tab. Reducing the number of tabs allows us to showcase a greater breadth and depth of content as soon as you visit the page. No. We still cover each event to the same high standard. You will still be able to follow the live text commentary of an event, watch live video, listen to live radio coverage, watch video clips and highlights, as well as follow the live scores and share your opinions by voting. 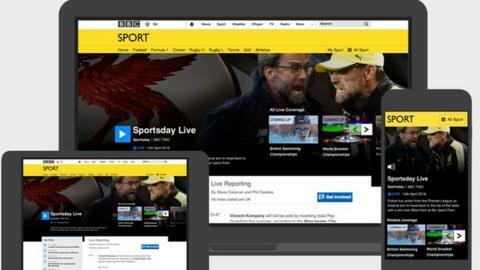 The new design will ensure the same content is available on all devices, with more of the content users have told us they value available on first load. What other parts of the site use new designs? We've started small, only a handful of Sports currently use this new design. Getting your feedback to make further improvements is more important than making sweeping changes. Your feedback will be used to enhance the experience before we apply it to other sports and products across the BBC. We welcome all feedback on the new design - simply fill in the survey which is available on the new live event pages.